(v. 17) Now in the following instructions I do not commend you, because when you come together it is not for the better but for the worse. (v. 18) For, to begin with, when you come together as a church, I hear that there are divisions among you; and to some extent I believe it. (v. 19) Indeed, there have to be factions among you, for only so will it become clear who among you are genuine. (v. 20) When you come together, it is not really to eat the Lord’s supper. (v. 21) For when the time comes to eat, each of you goes ahead with your own supper, and one goes hungry and another becomes drunk. (v. 22) What! Do you not have homes to eat and drink in? Or do you show contempt for the church of God and humiliate those who have nothing? What should I say to you? Should I commend you? In this matter I do not commend you! (v. 23) For I received from the Lord what I also handed on to you, that the Lord Jesus on the night when he was betrayed took a loaf of bread, (v. 24) and when he had given thanks, he broke it and said, “This is my body that is for you. Do this in remembrance of me.” (v. 25) In the same way he took the cup also, after supper, saying, “This cup is the new covenant in my blood. Do this, as often as you drink it, in remembrance of me.” (v. 26) For as often as you eat this bread and drink the cup, you proclaim the Lord’s death until he comes. (v. 27) Whoever, therefore, eats the bread or drinks the cup of the Lord in an unworthy manner will be answerable for the body and blood of the Lord. “What can wash away my sin? Nothing but the blood of Jesus. What can make me whole again? Nothing but the blood of Jesus. Oh precious is the flow that makes me white as snow. No other fount I know. Nothing but the blood of Jesus.” This old-time hymn captures the central focus of many services of Holy Communion in the black church. These services are holy because they commemorate the atoning work of Jesus Christ on the cross. Many times, the blood of Jesus is highlighted, signifying his saving death that gives us life by washing us spiritually clean; thus, the hymns, prayers, sermons, and special music on this Sunday may also center their attention on the cross of Calvary. 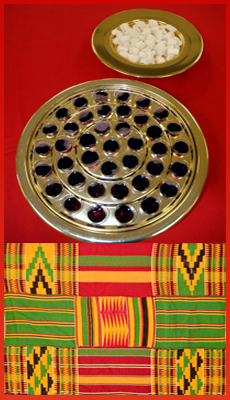 Holy Communion is probably one of the highest liturgical moments in many African American congregations. These days it seems as if many African Americans shed each others’ blood for senseless reasons. Too many have forgotten: “What can make [us] whole again. Nothing but the blood of Jesus.” There is so much black blood being spilled in our communities. Just recently, the mother, brother, and nephew of singer/actress Jennifer Hudson were brutally shot to death on the south side of Chicago. Her nephew received multiple bullet wounds and he was just seven years old. Innocent blood flows on the sidewalks and streets of many inner cities and to what end? What good does killing each other do? Black-on-black crime is not redemptive in anyway, yet it continues to be perpetuated in and outside the hood. These broken bones and poured out blood of humanity do not save or make whole in anyway. Yet, there is one whose blood gives us reason to stop causing each other to bleed to death. In fact, his blood is our lifeline. There is one whose brokenness heals our wounds. This one is none other than Jesus Christ whose blood will never lose its saving and healing power. The Corinthian Church needed the powerful blood and body of Christ because of its own brokenness. This church was like many of our churches—bruised and broken, bleeding to death. They were divided over so many things; thus, they collided with each other all the time. They do not even trust “Pastor” Paul. They question his leadership so much that he has to defend himself (I Cor. 9:3). The congregation “quarrels” over who is in charge of the Church (I Cor. 1:11-13). It is clear they have lost focus because they “magnify the messenger and miss the message.”¹ Paul wants to get back on message, focus on the story of Jesus Christ, thus he urges them to “be in agreement and that there be no divisions among you, but that you be united in the same mind and the same purpose” (1 Cor. 11:10). His core message is the broken body and blood of Jesus, “Jesus Christ, and him crucified” (1 Cor. 2:2). In other words, Paul wants them to hear “Oh the blood of Jesus it washes white as snow.” Paul attempts to get this church to stop sucking the life blood out of each other and focus on the blood of Christ that is life for all. Paul calls for this divided people to be unified in Christ, but this church is so broken and bleeding from its internal wounds that it is hard for him to get his message across to them. Even at the Lord’s Supper, Holy Communion, trouble brews. When they come together to commune, they do not “come together” in unity (11:17, 18, 20, 33, 34) but in disunity (11:18; cf. 1:10). Paul says it is “for the worse” (11:17). The supper of unity has become one of disunity. “For when the time comes to eat, each of you goes ahead with your own supper, and one goes hungry and another becomes drunk . . . do you show contempt for the church of God and humiliate those who have nothing?” (11: 21-22) The major conflict is between the “haves” and “have-nots,” the rich and the poor, revealing the socioeconomic tension at the Corinthian table. In this cultural context, Paul is not talking about the Lord’s Supper as a liturgical rite in a church building. At this point in history, there were no separate buildings for Christian worship. The Lord’s Supper was a meal eaten by a community in private homes, pot-luck style. The Lord’s Supper happened as part of the common meal. Therefore, in someone’s home, at the table, there are those who don’t wait for others to start eating and those who disregard individuals who have nothing to eat. Paul is not dealing specifically with wrong sacramental theology, but wrong social relations in the community. They are not being one, and they do not care. There is no sense of the “common good” (12:7). They’ve forgotten how to love God and each other (chapter 13). The way they treat each other tears this community apart. In particular, “those who have nothing” (11:22) are treated badly. How are the poor treated today? It is no wonder that Dr. King died fighting on behalf of the poor in Memphis for more just wages. What a reminder on communion Sunday at the beginning of Black History Month. Many African Americans do not come from much money but sometimes, when they get more money, they forget where they came from; they get a high dose of amnesia. The brokenness of the Corinthian church at the table reveals that they have forgotten what it means to be the church in the first place. They forget what made them a church. They “demonstrate an odd amnesia about Jesus’ death.”² That’s why Paul tries to refocus them on the body and blood of the Lord. Only healing power can fix this bleeding church, so Paul turns to the words of Jesus and what he did for us, for there is “power, power, wonder-working power in the precious blood of the Lamb.” In the midst of their quarreling, Paul says what have become known as the words of institution, words familiar to many black congregations when holy communion is held—“This is my body that is for you. Do this in remembrance of me. . . .This cup is the new covenant in my blood. Do this, as often as you drink it, in remembrance of me” (11:24-25). Christ was broken, bled, and died that we might live and know how to live together in unity, knowing how to treat each other. His death is our salvation; it gives us new life as individuals and as a believing community. Thus, to eat the bread or drink the cup of the Lord in an unworthy manner means to keep acting in the same old broken way, as if Christ’s shed blood does not matter, didn’t save all of us. It means that one takes Christ’s work on the cross for granted and continues to mistreat his or her brothers and sisters in the church. If Christ grabs a hold of your heart, your life will change; thus, how you act in community will be different. There will be real communion, right relationships in the church. When we remember the body and blood of the Lord—do this in remembrance of me—we literally re-member, put back together, the broken body of Christ. Through the blood of Christ, the black community can be healed, meaning no more bloody streets. The blood will never lose its power! The blood of Christ saves us from sin. The blood of Christ saves us from ourselves and treating each other wrongly. Thank God for the old rugged cross. Thank God for Calvary. Thank God for healing our brokenness. Thank God for the blood. Textures: The coarse bread made from barley that the poor most often ate; the glossy texture of the cups and plates that were used; and the feel of bread crumbs in your hand. Kirk Franklin’s “The Blood Song” might be good to use because it focuses on how the blood of Christ saves us. Also, weaving in “blood” hymns throughout the sermon could foster greater sermon unity around the image of blood. The song is provided in full in the cultural resource unit for today. Use James Weldon Johnson’s “The Crucifixion” from God’s Trombones as a way to highlight the bloody work of salvation performed by Christ. This prose rendering is provided in the cultural resource unit for today. Preaching. Louisville, KY: John Knox Press, 1997. p. 24. 2. Hays, Richard B. First Corinthians: Interpretation, A Bible Commentary for Teaching and Preaching. p.199.